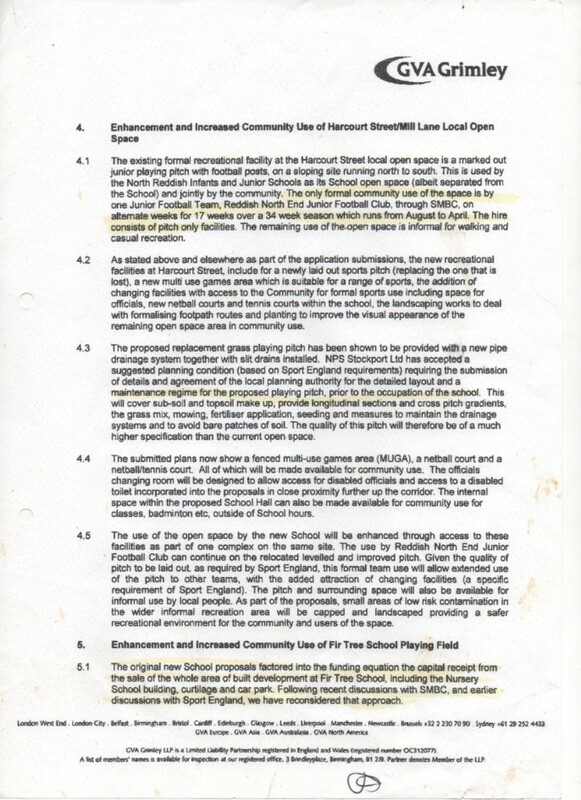 There are no promised sporting facilities at the new school? Why not? 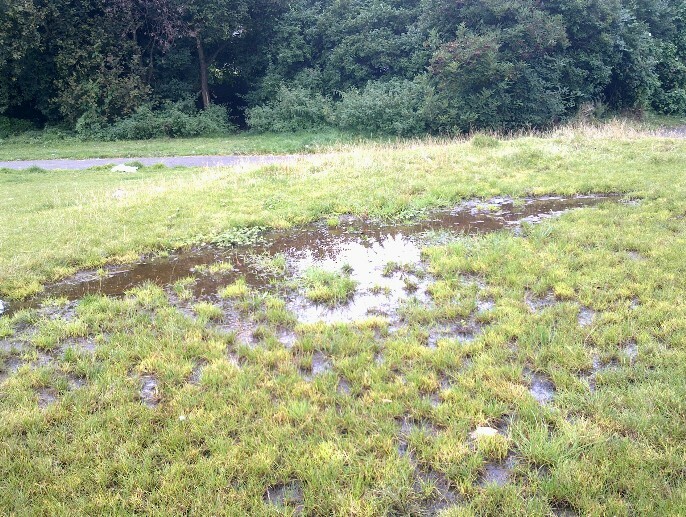 £280,000 was set aside for the demands of Sport England, which haven't been complied with as there are no sporting facilities for public use on the site. Where has this money gone? I shall ask a Freedom of Information question and post up their response. See above. 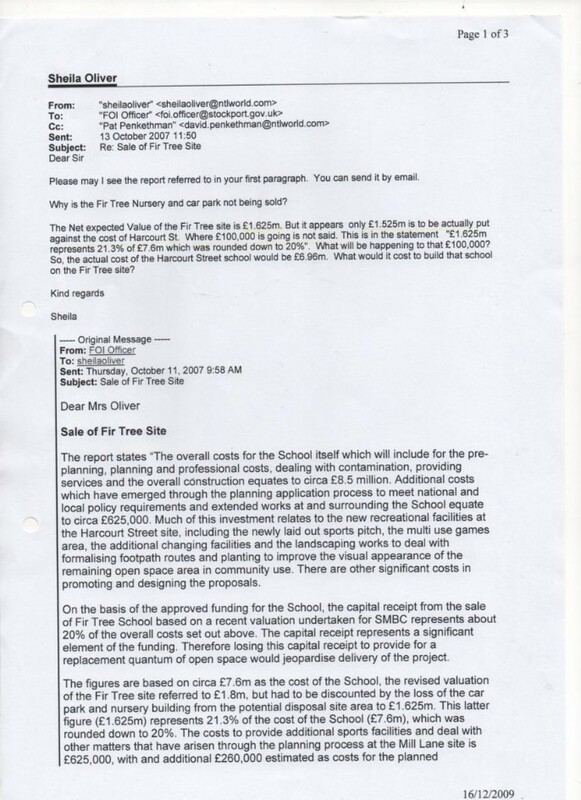 So they got this dodgy scheme through planning on the promise of sporting facilities for local people on the site. They should have been there before the school was built. Where are they? 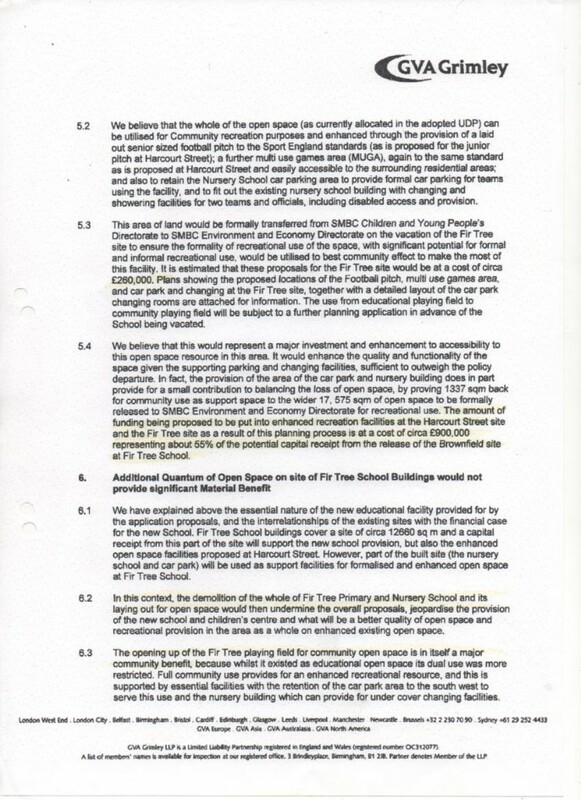 The building of the school is contrary to the Unitary Development Plan which had the land earmarked a public open space and also, strangely enough, for a replacement school for North Reddish Juniors only. 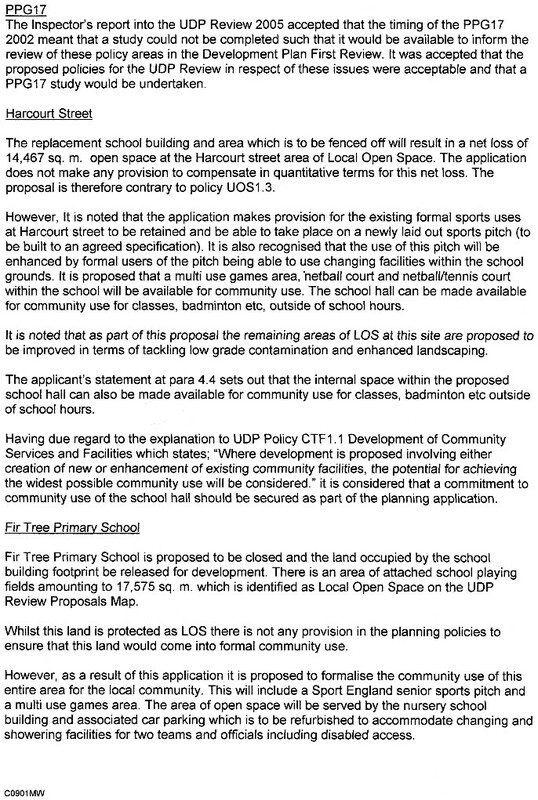 Firstly, a replacement for one small school is not what has been built and secondly there are no leisure facilities as promised in the letter from planning consultants - GVA Grimley. 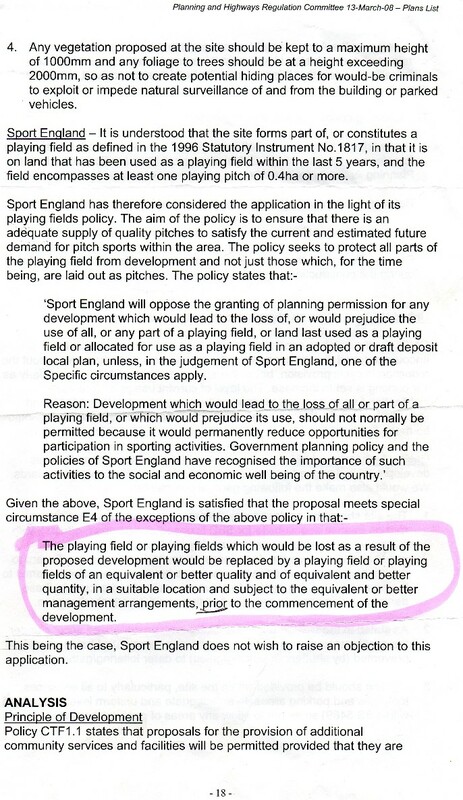 They have taken public playing fields and not replaced them. 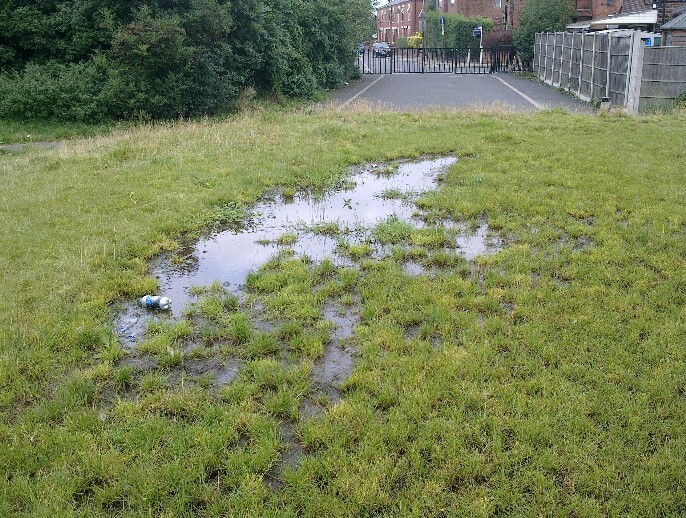 The photos above show the poor drainage at what is supposed to be the replacement sports field. I have spoken to the Council’s consultants, NPS, who have stated an allowance in the region of £500,000 has been estimated for the cost of providing additional the requirements as suggested by Sports England. 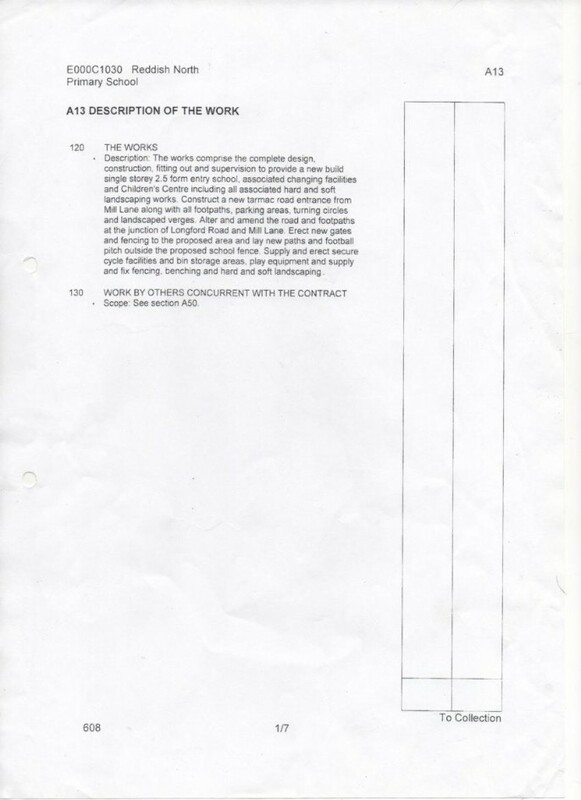 It should be noted that this figure is an estimate and the actual costs will be known once a contractor has been chosen to do this work if Planning Permission is granted for the application." I never made any such quote to you. I made no comments on the financial state of the borough or CYPD. 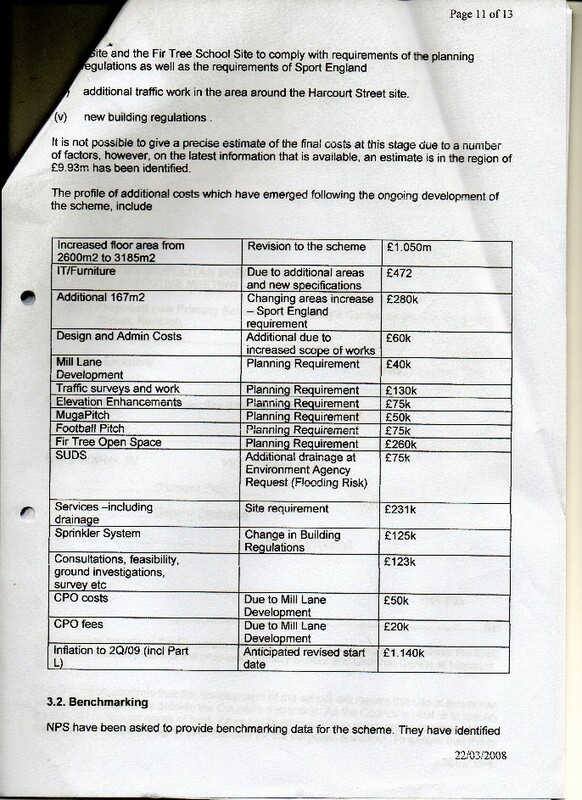 I merely expressed the thought that the money spent on the sports facilities were welcome in a deprived area of the borough and questioned your motives in trying to stop it. My comments were made in the presence of Cllr Hogg and Mrs Donna Sagar whom I am sure can verify the exchange. It is because of this type of unreliable reporting that I was and remain unwilling to talk to you without a witness. You do your case no good by resorting to fabrication. I have copies of my communications with Sport England's Chief Executive. 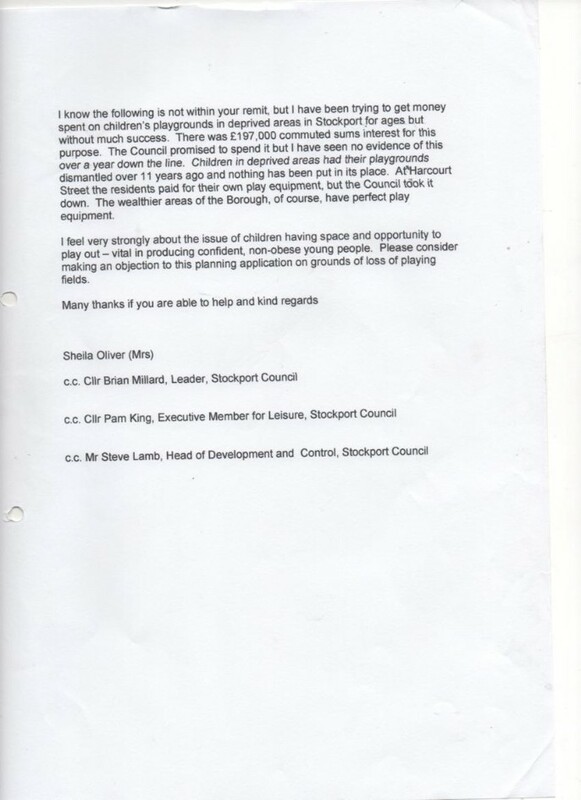 Following his kind intervention after my communication with him the Council was forced to agree to provide recreational facilities for young people which it would not otherwise have done. Unlike councillors, I do not try to claim credit for something I have not done. I am delighted at the prospect of the "golden elephants". 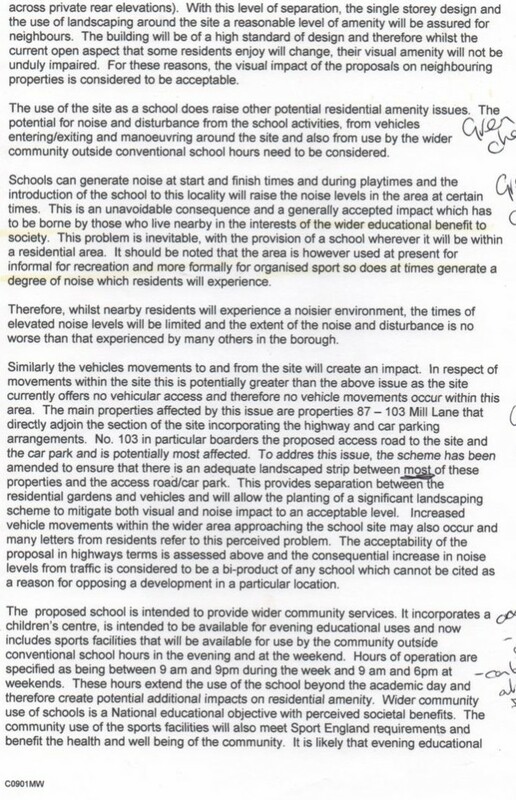 If the proposed school does go ahead, then at least I will have the consolation of having brought about recreational improvements worth over half a million pounds for the young people of North Reddish, whom the Council seeks to deprive at every turn, including the shutting of the local swimming baths and the transference of equipment to the baths in the affluent area of Hazel Grove. I remember forcing the Council to spend £197,000 of commuted sums interest on playgrounds, and Councillor Meikle took all the credit. Whoever it was got that money for local people it was certainly not her! As the Council has reduced the opportunities for council taxpayers to hold them to account democratically, with official notes made of questions and sometimes answers, by over 50%, then we will have more of these problem encounters you mention with disputed outcomes. It is called democracy and if you try to circumvent it it leads to difficulties. You can't just have the fat cat allowances and council officer wages - some ludicrously high - without accountability. Under the Freedom of Information Act and Environmental Information Regulations 2004, please may I see your contemporaneous handwritten notes from May 07? I am delighted that you are taking an interest in these spiralling costs. 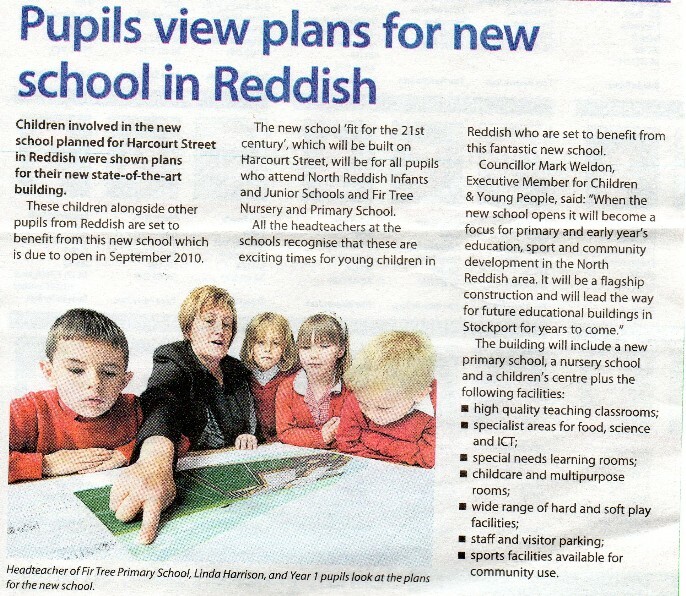 Have you considered simply carrying out improvements to the Fir Tree and North Reddish schools instead, which is a solution which would leave the people of North Reddish relieved and delighted? 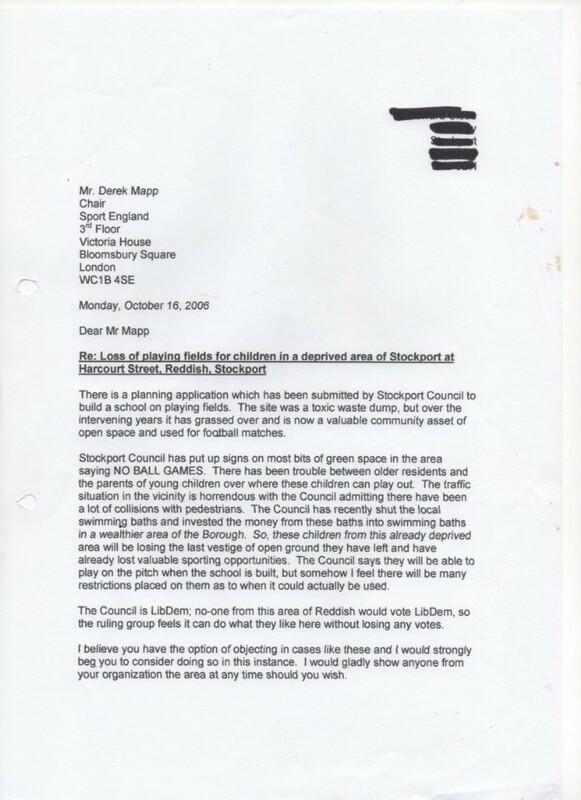 Regarding wasting Council resources, I note you are on the Stepping Hill Area Committee. 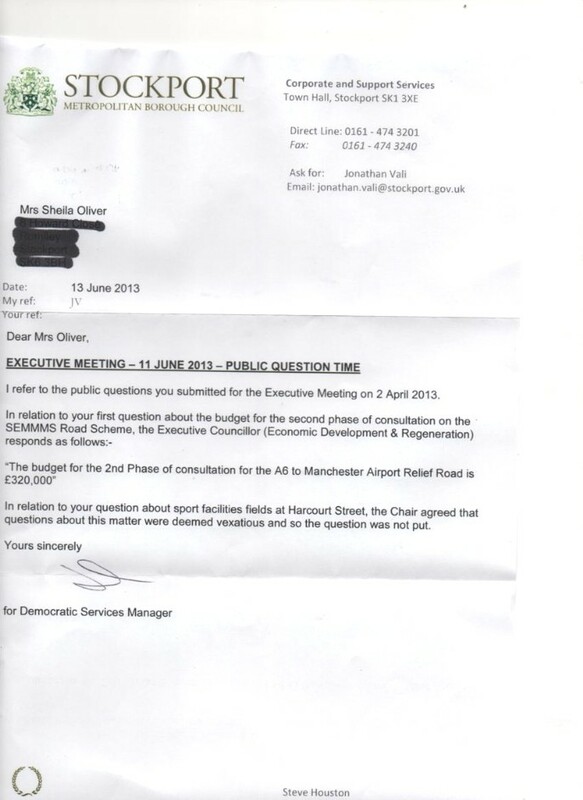 How was it that I, and not you as a paid councillor, had to point out that almost £900,000 of commuted sums money for sustainable transport was still lying in Sainsbury's bank account, gathering interest for them, seven years after it should have been spent and with the likelihood that it would return to Sainsbury's possession within a short period of time if it hadn't been spent? It is your job to keep your eye on things like this. I am just a hospital typist. I got the £17,000 spent on the vital pedestrian link for Cow Lane. I got the £50,000 SEMMMS money for improvements at Offerton Precinct. I pointed out that we paid SEMMMS traffic consultants £1,400,000 in one year alone for a road which everyone privately admits will never be built. Don't you dare accuse me of wasting council resources.